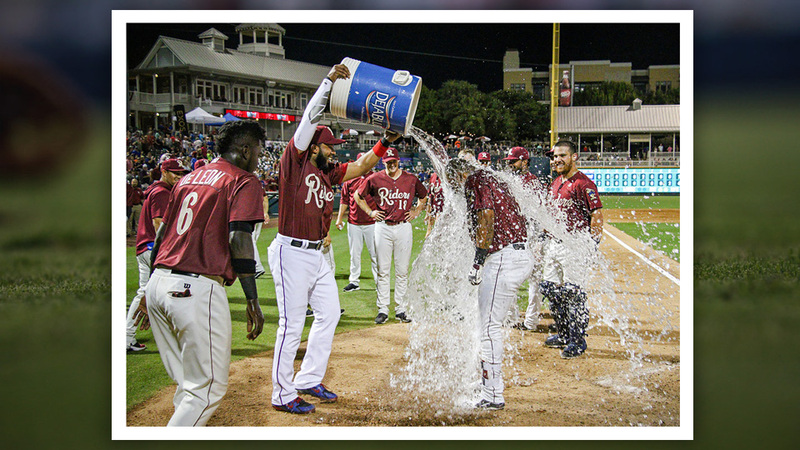 Rangers prospect Josh Morgan hit a dramatic, two-run walk-off homer on June 15 for Double-A Frisco, and the scene at Dr Pepper Ballpark looked like one from the Majors. Fans rose from their seats, fireworks lit up the Texas sky and veteran big leaguer Elvis Andrus dumped a cooler of icy water at home plate as Morgan's teammates surrounded him to celebrate. Caitlyn Epes, an intern with Frisco and a junior at the University of Oklahoma, captured the moment when Andrus grabbed a blue cooler and poured out gallons of slush on Morgan's head. "I think it kind of represents Minor League Baseball," Epes said. "Elvis Andrus was rehabbing and he brought that Major League feel to a Minor League game. After a walk-off win, it was really exciting to be there in that moment, and I think it just shows the audience a rehabber going down to a Minor League game and the team embracing him and the excitement of Minor League Baseball." Fans this month agreed and voted the image as the 2018 MiLBY Photo of the Year. The photo beat out other finalists that showcased fireworks, lightning strikes, rainbows and acrobatic catches. Epes, who grew up about 30 minutes south of Frisco, interned for the RoughRiders this past summer before returning to OU, where she is the visual editor for the university's student newspaper, The OU Daily. "I applied for their internship program last fall and started working for them in May and all summer," she said. "I live in Garland, Texas, so I've been going to Frisco games my whole life. It was exciting to be on the other side of it." The stage was set for Epes and Morgan on June 15 when Preston Beck singled in the ninth and Morgan connected on a two-out pitch against San Antonio, sending a game-winning homer over the wall in left-center field for a 4-2 victory. "I saw him hit the home run and I thought, 'OK, this is going to be exciting,'" she said. "We went on the field and I saw Elvis get the water cooler and he was walking real slowly. I saw Morgan walk to home plate and everyone gathered around, and Elvis poured out the ice and it was a great moment. I didn't stop shooting, and immediately afterward, I was showing everyone the images. I was really excited about it." Epes said she made the photo with a Canon EOS 7D Mark II and an 18-135 mm lens. Frisco used one of her images in its game recap as well. The aspiring sports photographer said she rallied friends, family and coworkers to support her in MiLBY voting this past month. "My boss at Frisco said, 'Hey, we're submitting things for contests, what's your favorite photo?' I sent them a couple options, and when I saw I was nominated on MiLB.com, I was extremely excited. I think it was a great honor to just be nominated. I shared it on social media and my friends, coworkers, family -- we were voting nonstop. The night before voting closed, I was voting for hours, so I'm really excited about it." Epes' image easily walked away with the MiLBY, while Patrick Cavey's "Hard Landing" image of Harrisburg outfielder Daniel Johnson finished second in voting with 13 percent to Epes' 58 percent. David Monseur's snap of a diving catch by Akron's Andrew Calica finished a close third with 11 percent. Epes said she was stunned when she found out she'd won this week. "I'm kind of shocked by it -- I'm really grateful for it," she said. "I took a lot of photos this season but that was honestly my favorite one -- it's been my favorite one for a while and I'm glad people liked it." Epes already has an impressive portfolio of work from covering OU football, including Baker Mayfield and the Sooners' Big 12 championship last season. This season, she's snapped current OU quarterback Kyler Murray, who is also among the Oakland A's top prospects as an outfielder. "I'm grateful for the opportunity. It's easy to be a sports photographer at OU -- they're good at sports," she said with a laugh. "From football to baseball was a weird transition, but it helped me get all the sports under my belt. I've gotten a lot of experience through OU, and that helped me get that internship with the RoughRiders." Epes also said she enjoyed seeing the MiLBY finalists from around the Minors. "I was impressed with the diversity of the photos -- I thought they would all be action shots," she said. "I was impressed that some people got nominated twice. But I was honored to be in that category, and most of those photos were amazing. I'm just happy I won and happy to have interned in Frisco and that they could give me this honor."